The name of a group of kindred tribes scattered over portions of Syria, Mesopotamia, and Arabia. It is not the name of a country or of a politically independent people; for the Aramaic peoples were never all independent at the same period; neither did they form a large independent state. They are mentioned by Tiglath-pileser I., about 1110 B.C. (Schrader "K. B." i. 33), as dwelling east of the Euphrates; also by Shalmaneser II.(ib. i. 165). Tiglath-pileser III. describes them as extending from the Tigris, the Euphrates, and the Surappi to the River Ukni at the shore of the Persian Gulf (ib. ii. 11). Sargon and Sennacherib attest this in part by stating that on their return from Babylon to Assyria they conquered various Aramaic tribes (compare Schrader, "K. G. F." pp. 109 et seq. ); and the presence of Aramaic inscriptions in Assyria and Babylonia from the eighth to the third century B.C. confirms these statements (compare "C. I. S." ii.). The inscriptions found at Zenjirli and Nerab prove that Aramaic was spoken in the northern part of Syria as early as the seventh century B.C., though this region was largely occupied by Hittites. Aramaic tribes appear to have extended as far as the Taurus valleys, including Armenia and Cilicia (compare Dillmann, on Gen. x. 22). Aramaic inscriptions have been found in Arabia as far south as Teima, which date from about 500 B.C. These tribes had therefore penetrated Arabia at that date. The part of this territory known in the Old Testament as Aram is the portion west of the Euphrates, to various parts of which were given different names, as described below (Aram-Zobah, Aram-Maachah, etc.). Greek writers applied to the people of this region the term "Syrians"—perhaps a corruption of Assyrians; hence the name "Syria." In Gen. x. 22 Aram is described as a son of Shem. Gen. xxii. 21 makes him a grandson of Nahor, Abraham's brother. The Aramaic dialects form a well-defined group of the languages classed as Semitic, and thus attest the fact, for which these traditions stand, that the Arameans were akin to the Hebrews. From II Kings xviii. 26 and Isa. xxxvi. 11 it would seem that by the end of the eighth century B.C. Aramaic had become the language of international communication between the nations of western Asia. Its influence on Hebrew diction may be detected in some of the books composed before the Exile, while in Esther, Ecclesiastes, and some of the Psalms the form of expression is largely Aramaic. Parts of Daniel and Ezra are extant only in this tongue, which before the beginning of the common era had quite displaced Hebrew in popular usage. The Aramaic peoples of northern Arabia introduced writing into that country some centuries before the Arabs of the region had their own system of writing; and the Aramaic inscriptions found by Euting in the Sinaitic peninsula, and shown to have been the work of Arabs, prove that for a time it was the language used for written communication in north Arabia. The Nabatæans, who were in reality Arabians, have also left in the neighborhood of Palmyra many Aramaic inscriptions dating back to about the beginning of the common era. Josephus calls Aram the grandson of Nahor, Abraham's brother (Gen. xxii. 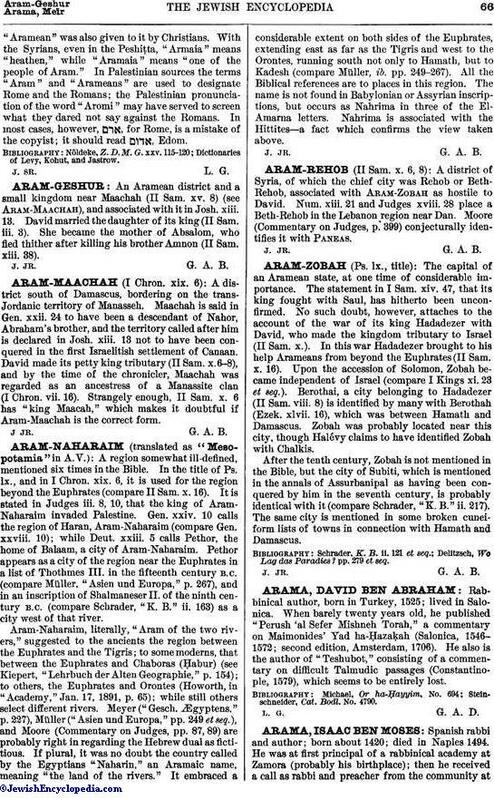 21), and afterward defines his locality as Aram Naharaim (Gen. xxiv. 10). Gen. xxviii. 10 says that Jacob fled to Haran, where he went to his mother's kindred, thus making Aram Naharaim a region beyond the Euphrates. In the Pentateuch the country about Haran is no doubt the region designated. That Abraham resided in Haran is definitely stated in the Pentateuch (Gen. xii. 4, 5). The place to which Jacob fled is called Padan-Aram (Gen. xxviii. 6, R. V.). "Padana" in Aramaic signifies "yoke," or "plow," and may also have meant, as in some other tongues, "cultivated land." Some find in this meaning the origin of the name "Padan" in Genesis, and have supposed that "the field of Aram" (Hosea xii. 13 [A.V. 12]) is a Hebrew translation. It is tempting to identify it with the Aramaic "Paddānā" (Wright, "Catalogue Syriac Manuscripts," 1127a), called in Greek ψαδανᾶ (Sozomen, vi. 33), and in Arabic "Faddain" (Yaḳut); but this town was situated in the Hauran, and can not have been the Padan of the Bible, unless it was there intended to say that Laban, like Abraham, had migrated far from Haran. It may be, as Nöldeke suggests, that this name arose from a localization of the patriarchal tradition by the early Christians. That a place in the neighborhood of Haran, or in that region, was intended, there can be little doubt. All the sources place the Aram of the patriarchs in the direction of Haran. Deuteronomy mentions Aram only when Jaeob is called an Aramean (Deut. xxvi. 5). By far the most important part of Aram, so far as the Hebrews were concerned, was Damascus. Amos (i. 5) and Isaiah (vii. 8) indicate this; the one by equating Aram with Damascus, the other by declaring that Damascus is the head of Aram. The name occurs in a list of cities conquered by Thothmes III. (W. Max Müller, "Asien und Europa," p. 227), and in two of the El-Amarna letters (139, 63 and 142, 21) of the fifteenth century B.C. David, some centuries later, made it tributary to himself (II Sam. viii. 6), and its kings, Rezin, Ben-hadad I., Ben-hadad II., Hazael, and Ben-hadad III., were at various times in conflict with the kings of Israel and Judah. Compare Damascus, David, Ben-hadad, Hazael, and Rezin. See also Aram-Geshur, Aram-Maachah, Aram-Naharaim, Aram-Rehob, and Aram-Zobah. Dillmann, Commentary to Genesis, x. 22, 23. 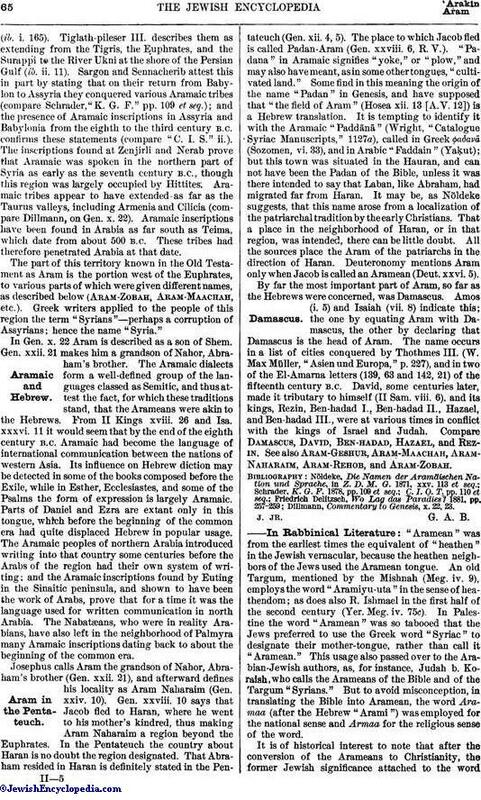 "Aramean" was from the earliest times the equivalent of "heathen" in the Jewish vernacular, because the heathen neighbors of the Jews used the Aramean tongue. 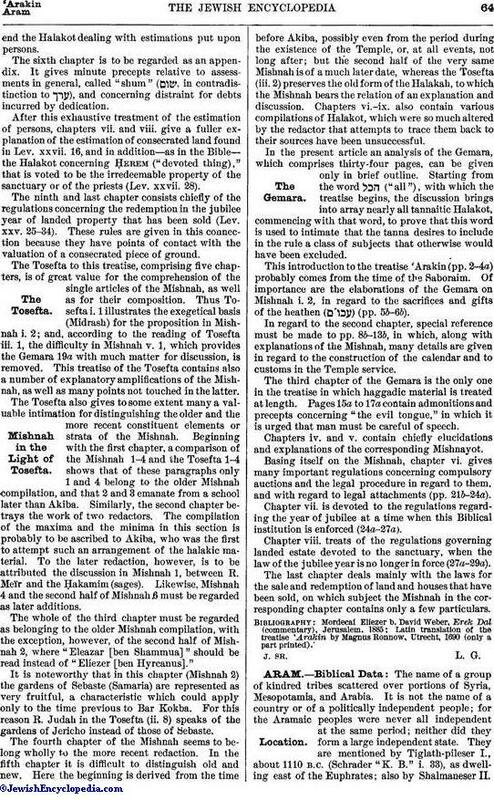 An old Targum, mentioned by the Mishnah (Meg. iv. 9), employs the word "Aramiyu-uta" in the sense of heathendom; as does also R. Ishmael in the first half of the second century (Yer. Meg. iv. 75c). In Palestine the word "Aramean" was so tabooed that the Jews preferred to use the Greek word "Syriac" to designate their mother-tongue, rather than call it "Aramean." This usage also passed over to the Arabian-Jewish authors, as, for instance, Judah b. Koraish, who calls the Arameans of the Bible and of the Targum "Syrians." But to avoid misconception, in translating the Bible into Aramean, the word Aramaa (after the Hebrew "Arami") was employed for the national sense and Armaa for the religious sense of the word. It is of historical interest to note that after the conversion of the Arameans to Christianity, the former Jewish significance attached to the word"Aramean" was also given to it by Christians. With the Syrians, even in the Peshiṭta, "Armaia" means "heathen," while "Aramaia" means "one of the people of Aram." In Palestinian sources the terms "Aram" and "Arameans" are used to designate Rome and the Romans; the Palestinian pronunciation of the word "Aromi" may have served to screen what they dared not say against the Romans. In most cases, however, , for Rome, is a mistake of the copyist; it should read , Edom. Dictionaries of Levy, Kohut, and Jastrow.